great exposure to women in the underground punk scene. It's not news that the Internet can make life a lot easier. If you're an artist, you can start a Tumblr or Cargo Collective to showcase your work. If you're a musician, you can put your music on Bandcamp or Soundcloud in a matter of minutes. And from there, the entire digital world can get a peak of your creative output. But this accessibility can also be limiting due to the overwhelming amount of music, art, etc on the Internet. This especially rings true for women who might find it difficult to even just break into their local scene. So when Kelly Riel and Alyssa Caparas decided to start their own feminist DIY label, they wanted to try and minimize this issue as much as they could. They figured the best way to do this would be to start a compilation series, which would give exposure to as many artists doing great things as possible. But let's backtrack a little: Kelly and Alyssa originally started Stick Shift Records in Burlington to make more of a positive impact on the punk scene and community, especially involving female, trans, and queer artists. They realized with their own experience in music and design, they had the means to run their own label. Stick Shift Records released their first compilation, First Gear: Feminism in the Northeast, towards the end of last summer. The track list was filled with a few names that were familiar to us, such as Potty Mouth and Poxy, but the comp acted as an introduction to many new bands. The latest installment, Clarion Call, is a call to action to make the punk scene a more inclusive space. The bands on Clarion Call hail from all over the world, from Connecticut's Snotrocket to France's Lilidollrage. After listening, it's evident that Kelly and Alyssa fulfilled their original goal of gaining exposure. Without Clarion Call, I might not have ever heard of San Francisco's ska-esque Sarchasm or Brooklyn's angst-filled Girlcrush, even though we're based in the same city. You can purchase Clarion Call on CD for $2 and I can guarantee it will be perfect for screaming along to in your car while you plot to take down the patriarchy. 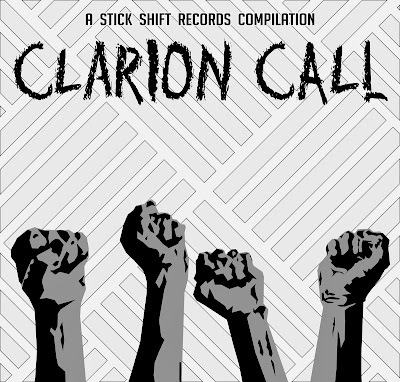 Listen to Stick Shift Records' compilations on bandcamp.